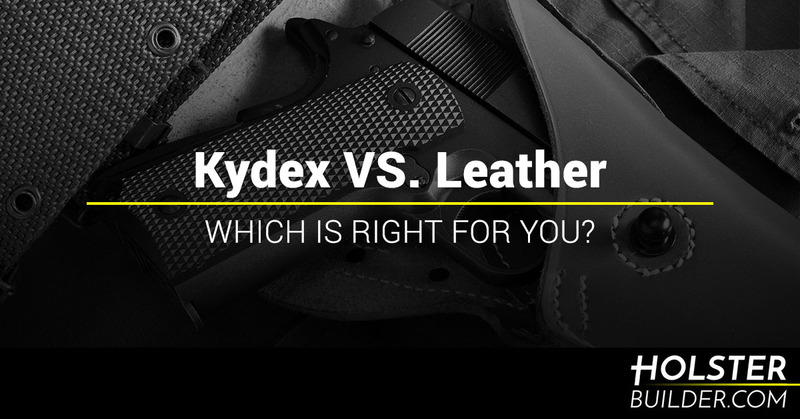 Kydex Vs. Leather: Which is Right For You? If you build holsters, there’s a good chance that you’ve considered your options in terms of using kydex versus using leather. Is one better than the other? It’s a good question, of course, and the answer is that there are pros and cons to each. It’s also true that different people are going to prefer different things. Either way, if you’re searching for holster making supplies, you’re in the right spot! If you know anything about the team at Holster Builder, you are probably aware that we take a great deal of pride and joy in helping other holster makers out there. You might know us from running Eclipse Holsters; that business has been around for five years now. We started then by knowing very little about the process of making holsters and we’ve learned a great deal in that time. That’s why in today’s post we’d like to have a discussion on kydex and leather. If you’re on the fence, keep reading to learn more. As we mentioned above, different people are inevitably going to prefer different things. It’s what makes us all unique, after all, and that’s a good thing! If you have checked out our YouTube channel then you probably know we are big proponents of being able to assemble holsters quickly and easily. At the end of the day, this is what allows us to spend more time with family. Leather holsters will probably take much longer to assemble. This isn’t necessarily a bad thing, but it is important to note that you should adjust your prices accordingly. Our advice is to figure out what your ideal “day rate” is, then figure out how many leather holsters you can make per day. Do a little math, and you’ll figure out what you should be charging for each holster. If this number is higher than similar holsters, you may have a hard time selling yours unless there’s something particularly unique about it. Perhaps you could opt for the best of both worlds with one of our finished leather backers? There’s a lot to love about kydex, and we’ll be the first to mention that we love it for its ease of use. As you probably know, you can find kydex sheets for sale in a number of different colors. If there’s one thing people love in this day and age, it’s being able to express themselves. That’s why they appreciate having the choice between camo patterns, carbon fiber patterns, solid colors, and more. We strive to be one of the top kydex sheet suppliers and a quick look at our kydex shows the whole breadth of what is available. In short, if you’re in need of kydex supplies, we have them, along with belt attachments, holster shells, and all of the other holster making supplies that you need to craft the perfect holster for your customers. So will you be making leather holsters or kydex holsters? The answer is that it’s up to you entirely. You likely have a good idea of the type of customer you’re trying to attract and it’s your job to carve out a space in the market. Allow us to reiterate that if you have a question about the process, we’d love to chat with you. Don’t hesitate to send us an email or give us a call because we would be happy to offer advice or answer your questions. Reach out today, or feel free to take a look around to shop for the supplies you need to start crafting holsters with your own unique take. We will be here to help along the way! By Holster Builder|2018-11-02T10:11:44-05:00October 30th, 2018|Holster Making Supplies|Comments Off on Kydex Vs. Leather: Which is Right For You?